Gain an insight into the color meanings symbolism of the secret and mysterious symbols used by Native American Indians. Understand the significance of pictures - such as the Iowa Indian picture. What is the significance of the red and black face paint? Native Indian symbols are still used as Tattoos and were used for a variety of reasons and depicted on numerous objects such as tepees, War Paint and clothes. But what was the significance of the colors they used? The color meanings symbolism of the Native American Indians. There were so many tribes of Native American Indians it is only possible to generalise the most common meanings of the color meanings symbolism of the paint they used. For additional information refer to the article on the Interpretation of Symbols. The following list provides generalized details of each color, its meanings and its symbolism. Red Color Meanings and Symbolism: The color of red symbolised violence, war, blood, wounds, strength, energy, power and success in war paint but might also symbolise happiness and beauty in face paint. The meaning of the Lightning symbol represented lightning which was believed to add power and speed to the warrior. 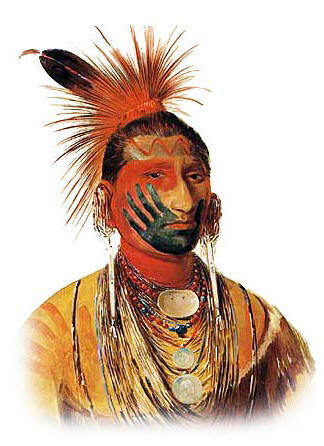 Lightning and the zig-zag symbol, painted in red as shown in the above picture of the Iowa Indian, is also associated with the legendary Thunderbird. Black Color Meanings and Symbolism: The color of black was perceived as a "living" color and worn on the face to prepare for war as shown in the above picture. Black is a very aggressive color. Black meant strength. It might also indicated that the wearer was a powerful warrior who had proved himself in battle. Black was also used to symbolize victory and might be applied before returning home to the camp. The meaning of the Hand Symbol represented success in hand to hand combat. It symbolized human life and this sign was believed to channel energy to the wearer. The color of black was produced from coal or charcoal mixed with spit or animal fat. White Color Meanings and Symbolism: The color of white symbolised mourning but might also mean peace and happiness. White was also the color used to represent winter or snow. White was the color of peace when it was used as face paint. The color of white was produced from clay, limestone, ground gypsum, eggshells or sea shells. Green Color Meanings and Symbolism: The color green symbolised endurance. Green is associated with harmony and is a great healing power and believed to improve vision. Green is the color associated with nature especially plants, hills, mountains, earth, summer and rain. The color of green was produced from moss or algae, flowers or berries. Many Native American Indians believe that certain colors have religious, or sacred, meanings and connotations. The Navajo tribe consider the colors blue, white, yellow, and black important as they represent four sacred mountains. The eastern mountains were white, the southern blue or turquoise, the western yellow, and the northern black. The rise and fall of these mountains caused the alternation of day and night. When the white mountains rose it was day, when the yellow ones rose it was twilight and the black mountains brought night, and the blue, dawn.